By traditional baseball standards, Scott Hatteberg’s big league days were numbered. As it was, Oakland A’s General Manager Billy Beane had been eyeing Hatteberg for several years, seeing a statistical diamond in the rough that was being overlooked by the rest of baseball. 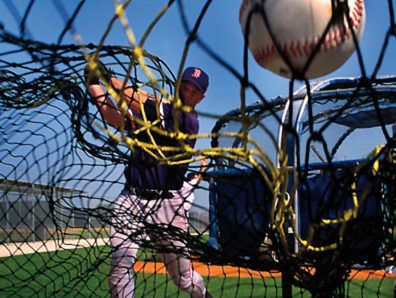 Most judges of baseball talent concentrated on running, throwing, fielding, hitting, and hitting with power. Typical of catchers, Hatteberg didn’t run well and his fielding was graceless—“I didn’t field ground balls, I tackled them.” His Red Sox batting average was a very average .267. He hit only a few home runs a season. And now he couldn’t throw. But Beane measured Hatteberg with a different yardstick. It was based less on casual observation and limited, antiquated statistics and more on objective analysis linking a player’s performance to what really mattered: winning games. Baseball fans know this as sabermetrics, from SABR, or the Society for American Baseball Research. Beane surmised that a player’s greatest contribution came through not making an out, be it by hitting, getting hit, or walking. A cardboard cutout could serve as a player, says Hatteberg, as long as it could get on base. Hatteberg himself was a better-than- average student of the game, a thinking man’s hitter. He had studied Yankee great Don Mattingly’s approach, which emphasized reducing strikeouts and maximizing walks. He knew the most powerful part of his swing was in a small area of the strike zone, low and in the middle. Patience and an eye for pitches in that spot had him going deep into the count, drawing walks and wearing out pitchers in the process. Beane and Paul DePodesta, assistant manager and holder of a Harvard University degree in economics, did analyze the numbers and concluded that getting on base was three times more important than slugging. They had also seen that Hatteberg’s on-base percentage was about 25 points higher than the league average. He walked far more often than he struck out. With some coaching, he could be moved to first base. And because the traditional metrics of baseball devalued Hatteberg’s skills, his salary was light on the A’s modest pocketbook. Readers of Moneyball and viewers of the new feature film it inspired know how the A’s thinking paid off. At the end of the season, DePodesta figured that if the A’s had nine Hattebergs in its lineup, it in effect would have had the best offense in baseball. Not bad for a broken-down catcher. That was 2002. The next year, the Boston Red Sox hired the dean of sabermetrics, Bill James, and went on to win the World Series in 2004 and 2007. But the field has its limits, he says. Among other things, it does not measure a player’s mindset, which changes in different situations. It can also make cold, calculated suggestions out of line with the sentiments of fans. So while it might be time for the Mariners to move Ichiro from the leadoff batting spot, or for the Yankees to have Derek Jeter pinch hit, managers know they make such moves at their political and vocational peril.